Everbuild - All Weather Roof Coating is a solvent based, full bodied black brushable bitumen compound with added fibres for reinforcement. 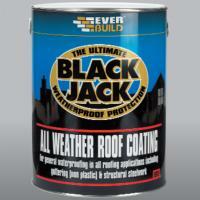 It is an effective general purpose roof coating that is resistant to wash off by rain almost immediately. The product is specifically designed for general waterproofing in all roofing applications, guttering (non plastic) and structural steelwork.